The ride begins just behind the eyeball and follows the optic nerve past the suprachiasmatic nucleus (which is critical for circadian rhythms) to the target destination: the superior colliculus. This region, which appears as the large bright oval, helps coordinate head and eye movements. The movie is a technical tour de force, which is why it was among the winners of the Federation of American Societies for Experimental Biology’s 2013 BioArt competition. As cool as this video is in its own right, it also provides a cutting edge tool to study connections inside the brain—without cutting it into thin slices. Right now, you might be experiencing a little déjà vu. That’s because last year I told you about a new technique called CLARITY that could make a normally opaque brain transparent. 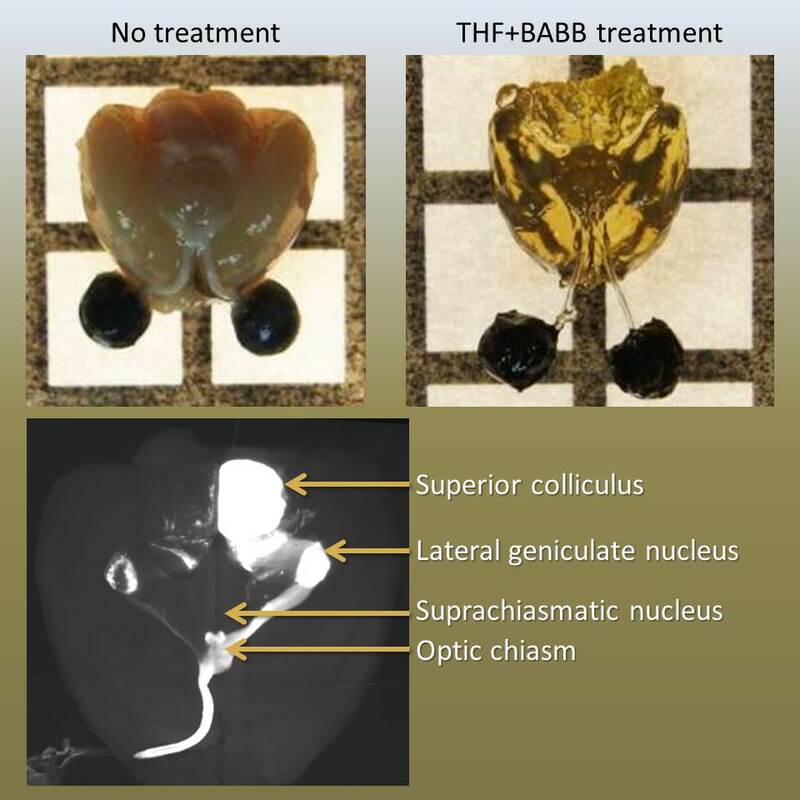 Park has modified a tetrahydrofuron based-chemical treatment that also makes the brain (and optic nerve) transparent . Park’s approach may even offer some advantages: it’s faster and doesn’t require special equipment, but it still allows the viewer to see how the neurons inside connect with each other. Park has harnessed this cutting-edge tool to study diseases that affect the optic nerve. In severe glaucoma, for example, these connections can be lost, leading to blindness. But Park and his colleagues are testing new therapies that may have the potential to regrow the retinal ganglion cells that make up this nerve and reform connections between them . To watch the neurons regrow and to see whether they make it to their target destination, Park uses fluorescence microscopy to check whether the therapy was successful: was the eye reconnected to appropriate brain structures? Recently, Park found that, while some nerve fibers do regrow and find their targets, most seem to be lost and simply meander. So, his next challenge will be to develop strategies for improving path-finding. The ultimate test will be to see whether these connections actually restore sight. Caption: Mouse brain before (left) and after (right) the chemical treatment that makes the brain transparent. Lower image: Brain regions shown in the movie. Application of tissue clearing and light sheet fluorescence microscopy to assess optic nerve regeneration in unsectioned tissues. Luo X, Yungher B, Park KK. Methods Mol Biol. 2014;1162:209-17. Promoting axon regeneration in the adult CNS by modulation of the PTEN/mTOR pathway. Park KK, Liu K, Hu Y, Smith PD, Wang C, Cai B, Xu B, Connolly L, Kramvis I, Sahin M, He Z. Science. 2008 Nov 7;322(5903):963-6. Fascinating! Thank you for sharing this great work. I look forward to the advancement of treatment of glaucoma and other eye and neurological disease. For me, this makes neuroscience exciting beyond the question of how the mind relates to the brain!